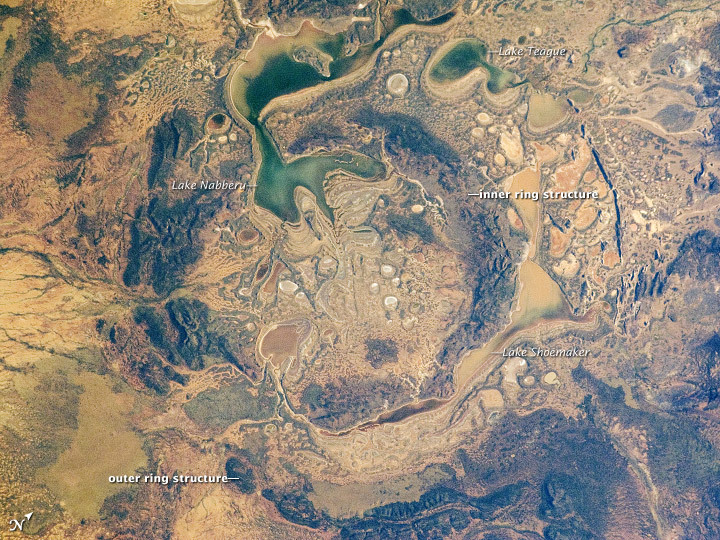 The Shoemaker (formerly Teague) Impact Structure - located in Western Australia in a drainage basin south of the Waldburg Range - presents an other-worldly appearance in this astronaut photograph. The Shoemaker impact site is approximately 30 kilometers (19 miles) in diameter and clearly defined by concentric ring structures formed in sedimentary rocks (brown to dark brown, image center). The rocks were deformed by the impact event approximately 1.63 billion years ago (as reported by the Earth Impact Database). Other age-dating analyses of granitic rocks at the core of the structure call this age into question (Pirajno et al. 2003). Several saline and ephemeral lakes - Nabberu, Teague, Shoemaker, and numerous smaller ponds - occupy the land surface between the ring structures. Differences in color result from both water depth and from suspended sediments, with some bright salt crusts visible around the edges of smaller ponds (image center). A Landsat 7 view of the Shoemaker structure illustrates the extent of these ephemeral lakes, or playas, in the region. The Teague Impact Structure was renamed Shoemaker in honor of Dr. Eugene M. Shoemaker (1928-1997), a pioneer in impact crater studies and planetary geology, as well as the founder of the Astrogeology Branch of the U.S. Geological Survey. Pirajno F., Hawke, P., Glikson, A.Y., Haines, P.W., and Uysal, T. (2003). Shoemaker impact structure, Western Australia. Australian Journal of Earth Sciences, 50:775-796. Astronaut photograph ISS028-E-14782 was acquired on July 6, 2011, with a Nikon D2Xs digital camera using a 200 mm lens, and is provided by the ISS Crew Earth Observations experiment and Image Science & Analysis Laboratory, Johnson Space Center. The image was taken by the Expedition 28 crew. The image has been cropped and enhanced to improve contrast. Lens artifacts have been removed. The International Space Station Program supports the laboratory as part of the ISS National Lab to help astronauts take pictures of Earth that will be of the greatest value to scientists and the public, and to make those images freely available on the Internet. Additional images taken by astronauts and cosmonauts can be viewed at the NASA/JSC Gateway to Astronaut Photography of Earth. Caption by William L. Stefanov, Jacobs/ESCG at NASA-JSC.